Northern Way Of Life. The name just about says it all and the beautiful photographs say the rest. The person behind the name and the photographs - Briana Paige - joins us for the latest 'Photographer Profile' here on The Fine Michigan Photography Blog. How long have you been photographing Michigan and the Leelanau Peninsula? Not long, actually! I bought my first DSLR just 4 years ago. Where is your favorite place to shoot in the Leelanau Peninsula? This is like asking me to choose my favorite kind of chocolate! ;) If picking a true favorite, it would have to be Sleeping Bear Point just south of Glen Arbor. The dunes and lakeshore there change constantly, and it’s always a treat to see what they look like each time I explore the area. I love standing at the top of the dune and looking out over the glittering blue water of Lake Michigan across to the Manitou islands. It’s just a magical place, and its almost as if you can feel the hum of nature out there. What is it about the Leelanau Peninsula that draws you to it? It’s home sweet home! I have lived on the Leelanau Peninsula for the last 10 years. I can’t imagine a more beautiful place to live. It offers 100 miles of Lake Michigan shoreline, quaint villages, rolling hills, orchards, and even a lighthouse. I can be doing mundane tasks like driving to the grocery store and see a dozen beautiful scenes along the way. I feel lucky every day! Do you have a favorite season in which to shoot? I love late autumn, specifically November. October is a tempting first choice with its flashy colors and sometimes late season warm temperatures. But quiet November brings fresh, crisp air and often foggy, moody landscapes—which are my favorite. With the arrival of November, the brilliant colors become muted and with the exodus of most tourists, the peninsula becomes very quiet....almost as if a hush has fallen over the land. I remember always enjoying the chance to use the family camera when I was growing up, and as I got older, I would try and take landscape photos—first with disposable cameras (Gasp! Don’t judge—it was the 90s!) and then with various point and shoots. I was always left frustrated though, as the end results were never what I had in mind. The real turning point occurred 4 years ago after a disastrous photo shoot of my children. I just knew deep down that I could teach myself to take the type of portrait shots I admired, and decided to invest in a quality camera so I could take nice photos of my kiddos anytime I wanted. Along the way I rediscovered my love of landscapes, and the rest is history! Social Media has given everyone a platform to share their work and it seems that Instagram is “your” platform. How do you feel Instagram has been beneficial for your style and images? And do you feel it’s better for your work than the other networks? Instagram became my launching point quite by accident 2 years ago. It was February, -20 degrees, and I had a bad case of cabin fever! I had a collection of landscapes I’d taken over the years with point and shoots and a handful from my DSLR and decided to start sharing them. I could hardly believe the positive response, and still can’t believe it to this day. I like Instagram because it features photos and videos only, and your work can speak for itself. I also like how easy it is to connect with other photographers and local businesses. With most commercial jobs I’ve landed, they say they’ve found me on Instagram! Speaking of Instagram, you and fellow photographer Heather Higham have recently started a new Instagram feed - @GrandTraverseLiving - what was the drive and goal of creating this feed? There are a number of Instagram accounts that feature Michigan images, but none that solely focused on sharing photos from the greater Grand Traverse area—one of our state’s most popular areas! We felt that was an untapped market. So we started Grand Traverse Living to feature images taken by both hobbyist and professional photographers of this beautiful area that both Heather and I are lucky enough to call home. We have lots of future plans for this account, so stay tuned! Being a landscape photographer ,we can sometimes make poor decisions in the field that put us in precarious positions... Have you ever found yourself in a dangerous spot while shooting? This is a boring answer, but I have yet to find myself in a truly scary spot as I am a rather cautious person! You will never find me out on the frozen lakes or exploring ice caves. And if I can’t find a buddy to accompany me for night shots, I shoot from the relative safety of my car. Maybe I end up missing some stellar images, but I have little ones to get home to every day and no photo is worth injury or losing my life over. Probably the most daring thing I do is some mild storm chasing. Here in northern Michigan we don’t usually get anything too overly severe, but every now and then we get a doozy like the August 2015 storm that destroyed Glen Arbor. Shelf clouds are by far my favorite—they’re so dramatic! The first shelf cloud I encountered, I didn’t know what it was or what was happening. I definitely underestimated how fast these storms move, and I waited a little too long to get back to my car....a mistake I have not repeated since! Is there anywhere in Michigan that you haven’t been and would like to shoot? As a lifelong Michigander, I am always a bit embarrassed to admit I have never been to Pictured Rocks! I have explored nearly every other corner of this state, even all the way up to Copper Harbor, but have somehow always bypassed this gem. It’s definitely on the list of places I need to see. Do you have a personal favorite image and what draws you to that image? If you could shoot anywhere in the U.S. (that isn’t Michigan) where would that be? I am a sucker for New England! I can’t get enough of its ancient cemeteries and coastal villages. I visited the area as a child, and my husband and I honeymooned there as well. All of these trips took place before I got serious about photography, so I’d love to go back to some of my favorite places and capture them properly! Where are your images available for purchase? And of course the readers will want to know what you have in the gear bag! Alright! That wraps up the latest 'Photographer Profile' and I would like to thank Briana Paige for participating and sharing her great work! Please take a moment and follow her on Instagram - here - and on Facebook - here. I would also like to thank you guys for taking the time to read this post! If you'd like to get future updates please subscribe below! 1,400. 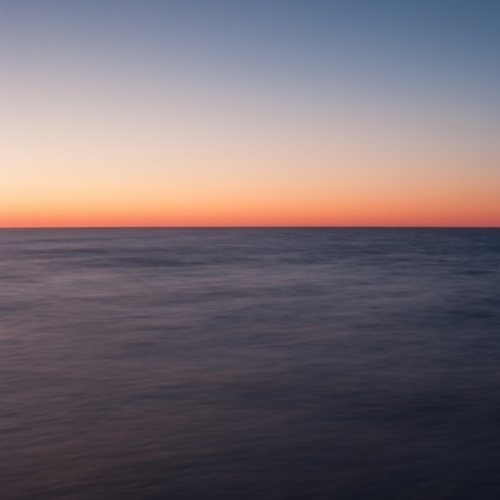 The shores of Lake Michigan measure approximately 1,400 miles. But to make my day I only need a sliver of that. I just need one small slice of sandy, quiet Lake Michigan beach and I'm happy as can be. The sound on a calm day of the waves quietly rolling in. The sound of the wind howling after a Autumn storm. The unforgettable light display as the sun goes below horizon. I love it all. Everyday it's different and everyday it's beautiful - sometimes in its freeze your tookis off "is the sun going to come out?" kind of way and sometimes in its "wow there is no place I'd rather be" kind of way. But the beach is a place you always want your camera at the ready - rain or shine. Luckily there are many parks, piers and public spaces along the Lakeshore for us all to enjoy. The sandy shores of South Haven stretch all the way past Sleeping Bear Dunes National Lakeshore and there is, of course, PLENTY to see in between. There is Saugatuck Dunes State Park, Big Red in Holland, The Grand Haven Pier, Silver Lake State Park, Ludington State Park and Big Sable Point Lighthouse and going north there's M22 and all things beautiful along that stretch! I could go on and on but I don't want to. I want to grab my gear and hit the road and get to a sliver of the 1,400 miles of beauty that is just waiting! So where are you going to go? What views do you hope to take in? Want to see expansive dunes? How about beautifully weathered driftwood? Just want to feel the sand between your toes? Let me know in the comments below where your favorite beach place is and once you're done typing get out there and enjoy it - and don't forget your camera! Thanks for reading this post! Please leave your comments below and feel free to hit that share button as well. Also, if you aren't signed up and want to receive blog and image updates just enter your email! The picture above is a picture of my actual camera. It's a Nikon. A D7100 to be exact. I like it. It's a good camera. It has knobs and buttons and dials and a pop-up flash... I think it has a pop-up flash. It's definitely not the best camera out there. In fact your camera is probably technically better than mine. The thing is, and not to be rude but I don't care. So many new cameras come out every year that it could make a persons head spin. There are full frame and crop sensor cameras. SLR and mirrorless cameras. They shoot High Definition video and now Ultra High Definition video. They shoot RAW and JPEG(never shoot JPEG)and of course you can buy good cameras from Nikon, Sony, Olympus, Fuji and Canon and of course Apple - nearly everyone has a camera right in their pocket or purse! They all claim to do different things and have better features from the previous version or their competitors model and they all claim they will make you a better, more efficient, more proficient photographer. And it's BS. It's marketing. Your camera does not matter. Ok... You caught me, maybe it does matter. But not as much as the camera manufacturers want you to believe. There are lots of great cameras out there and I'm not saying buy the cheapest one because they're the same - they're not. I'm simply saying do your research and realize that the camera is an important part of the equation but not the most important part. In your entire workflow your camera may possibly be the least important piece of equipment. We are just simply lead to believe that it's the most important piece of equipment. If you have bad lenses - your camera does not matter. If you have poor processing skills - your camera does not matter. If you have something as simple as a bad tripod or unreliable buggy memory cards - your camera does not matter. And most importantly if you do not have good creative vision - your camera does not matter. In my line of photography, landscape photography, there are 3 main components that are necessary to create a good image. A beautiful or intriguing scene, a camera and the photographer. Of those main three components the camera is the least important. Focus on more important things(no pun intended). Focus on your creative vision. Learn to look for light. Learn to look for shapes and designs that are organically appearing in your compositions. Learn how to use your camera but know that you are the most important piece of the puzzle. Yes, we all want the latest and greatest technology(myself included). It even has a name -G.A.S. - Gear Acquisition Syndrome. But please try your best to avoid it. Make the best of what you have and once you reach it's limits - and you can afford it - then go get the new camera. And when you do want to upgrade do it wisely. Remember that a lens is almost always more valuable than the camera it's connected to, so make sure it's a good one. Steadying your camera when composing that shot is so very important so get a good tripod. And most importantly YOU are the most valuable part of the "workflow". Invest in yourself. Take courses on processing. Learn Lightroom and Photoshop. Buy a book with great photography in it and study it. Buy a book about marketing and small business so you can sell your work and feed your hunger to create beautiful images. Photography is so much more than a camera. Now get out there and create some beautiful photographs - no matter what camera you have. Photographer Kristina Lishawa has been kind enough to share her amazing photographs and insights for the latest 'Photographer Profile' on the Fine Michigan Photography Blog. Take your time browsing through these incredible images, they do not disappoint! How long have you been photographing Michigan? I moved to Traverse City in 2009, and have been photographing Michigan for the past 6 years. Where is your favorite place in Michigan to shoot? That’s a tough one! I would have to say anywhere along the Sleeping Bear Dunes National Lakeshore. Like many others, I feel a deep and unexplainable connection to that part of Lake Michigan’s shoreline. Many people are aware but some may not be, you’re also a physician! Do you feel one skill helps(or influences) the other? I think art and medicine complement each other very well. A big part of medicine is art, and a big part of photography is science. They both require attention to detail, passion, and patience. I believe that being a photographer makes me a better doctor. The quiet hours I spend capturing nature’s beauty give me energy to listen well to my patients. Finding balance is essential no matter what your career or calling. How did you first end up behind the camera? My grandparents gave me my first camera when I was 8 or 9. It was a point-and-shoot 35 mm Vivitar film camera that turned on via a plastic sliding door in front of the lens. It didn’t produce the most stellar images, but I was hooked on the idea of capturing a moment in time. I went on to learn photography basics on a Minolta SLR film camera, and began to develop my own film and print from negatives in high school. I did study photography in college, but as I grew more interested in medicine, my camera was often left in the case. During the eight busy years of medical school and residency training, I took very few pictures. Starting my first job as a full time physician also left little time for art. I transitioned to part time work when my first son was born in 2010. Naturally, I began to photograph his sweet face, and my love for photography was rekindled at that time. I haven’t put the camera down since! I’m fairly hopeless with a pencil or paintbrush, so I embrace photography as my artistic outlet. What is your favorite season to shoot? Winter! Fewer things make me happier than sitting on a snow bank and photographing snowy owls. I also love the way ice forms as the winds blow off Lake Michigan, creating other worldly landscapes in familiar places. What photographers have influenced or inspired you the most? 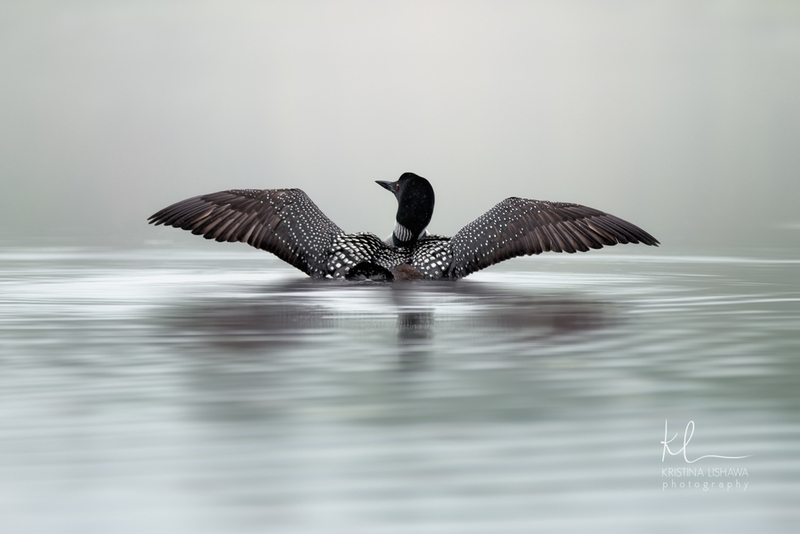 I am very active with the Traverse Area Camera Club and am constantly encouraged and inspired by this body of incredibly talented photographers. To name just one is very difficult, although I will never forget a pearl that was taught to me by nature and wildlife photographer Charles St. Charles: the human eye and the camera do not see light in the same way. Although I am not primarily a photojournalist, I adore the documentary work of Dorothea Lange, and have always been deeply moved by her Depression-era portraits of migrant laborers and impoverished individuals. Social media has had a huge impact on photography. Some say it's good and others say it's not so good. What do you think? It’s a mixed bag, I think. Social media is a powerful way to share your images (and what’s the point of taking the pictures if they aren’t enjoyed by others as well?). Like many other photographers, I have unfortunately had images stolen, altered, or used without permission. That’s a definite downside of social media. It can also be tempting to fall into the trap of trying to produce images that are “popular” rather than creating art that speaks from one’s own heart. What is the most dangerous situation you've been in while creating images? Well, there’s perceived danger and then there’s actual danger. I usually manage to convince myself I’m going to die at some point or another in the middle of the night when I’m out photographing the night sky. One dark winter midnight, I was walking the lakeshore alone when I saw the outline of huge beast skulking a few yards in front of me. My heart in my throat, I turned my headlamp on to discover a large piece of driftwood laughing at me. I have seen several large cats at night, but have never had any approach me. The situation with the most real potential for disaster probably involves skirting the steep icy apron of frozen Point Betsie in my spikes. Why do you love photographing Michigan? My husband is a Traverse City native, and although I am a transplant, I tease him that I love it here more than he does because of the tremendous photographic potential! There are incredible scenes that unfold in every season. My years are not marked by months but by patterns of nature, by the unfolding of incredible constellations of spring wildflowers, by vast dark night skies, by hypnotizing turquoise waters and sandy dunes, by scarcely traveled roads winding forever through golden leaves, by snowy owls and hummingbirds and all the other migrating birds that call Michigan home for a while. Michigan is a photographer’s treasure trove. If you had to shoot somewhere in the U.S. other than Michigan(or the Great Lakes Region) where would it be? The answer depends on whether I have a landscape or a birding lens on that day! I’ve always been intrigued by southwest landscapes, especially the red rocks and slot canyons of Arizona. I have also wanted to delve into some serious birding in the wetlands of Florida. Did you go to school for photography or are you self-taught? A little bit of both. I learned the basics of the exposure triangle, composition, and depth of field through photography courses. As I transitioned from film to digital photography, I taught myself to use Lightroom and Photoshop as editing tools. There are numerous video tutorials available that are great for learning digital retouching. Is there anywhere in Michigan you haven’t been and would like to shoot? In this season of having small children, I haven’t traveled much. I have never been to Pictured Rocks National Lakeshore in the Upper Peninsula, and I hope to explore and photograph the U.P. more in the years ahead. I have been to Seney National Wildlife Refuge, and could easily spend months photographing birds there! Do you have a personal favorite image and what draws you to it? The image that means the most to me is “The Lights Beyond” which is ironic since I rarely put people into my captures, least of all pictures of myself. This picture is a self portrait taken on November 3rd, 2015. I was out at Glen Haven watching an incredible display of Northern Lights in silent reverence. It was a bittersweet moment to remember the man who taught me to love the night skies as a child. My Grandpa, a pilot who loved adventure, used to say it had been a good day if you'd cheated death and won. He lost his life on November 3rd, fourteen years ago, when his airplane crashed in a tragic accident. I feel his smile when I go on crazy aurora hunts, and I feel this picture connects me to him again across the boundaries of space and time. I understand you have quite a few awards and recognitions under your belt! We'd love to hear what some of those are! One of my images (A Walk Under the Aurora) was featured in the National Geographic Editors’ Spotlight as a Top Shot photo in the summer of 2015. My images have been promoted by LensCulture, Pure Michigan, Traverse City Tourism, and Michigan in Pictures. I have won several photography contests sponsored by the Light, Space, & Time Online Art Gallery and the World Photography Network. The latter also featured me in a Photographer Spotlight interview. My image “Golden Reflection” received first place in a photography contest sponsored by the Watershed Center of Grand Traverse Bay in 2014, and “Friendly Grasshopper” took second place in the same contest this year. The printing company AdoramaPix featured my fireworks images and focus-pulling technique in a blog. The Traverse City Record Eagle wrote an article about my photography this spring (link: http://bit.ly/2b6xGvG) and I have had month-long exhibitions at the City Opera House and at the Botanic Gardens at Historic Barns Park in Traverse City. Folks always like a list of gear - so here is what Kristina takes to the field. That's it for the latest Photographer Profile! Thank you very much for taking the time to read the post and view the gorgeous photos from Kristina! Be sure to take some extra time and checkout her website kristinalishawa.com and be sure to follow her on Facebook. She also sells her work at Ugly Tomato Farm Market in Glen Arbor. If you want to stay up to date on all the latest posts from the Fine Michigan Photography Blog be sure to subscribe below! Just outside of Ann Arbor is a stretch of the Huron River that captivates me every time I visit. With regular seasonal changes and water level fluctuations it is always an amazing area to photograph. There are three parks that I visit with regularity when I explore this area; Hudson Mills, Dexter-Huron, and my favorite Delhi Metropark. It is in large part because of these parks that the Huron River is one of My Favorite Places. Hudson Mills Metropark is easy to access and lies just nine miles to the west of US 23 via N. Territorial Road. There is plenty to do at this 1,500 acre park including hiking, biking and disc golf but that's of course not why I go! When I enter the park I immediately head to the bank of the Huron River and grab the camera. There is very easy access to the Huron River by simply heading west on the service drive and taking another right turn to a small parking lot near the shore of the river. Large boulders and beautiful surrounding forest make photographing this part of the Huron River quite enjoyable. While it is a very popular park I seldom run into many people in this area of the park. From Hudson Mills I generally head to Dexter-Huron Metropark which is only 6 miles via Huron River Drive. At 122 acres this park is substantially smaller than Hudson Mills and of the three parks Dexter-Huron is the one that I visit the least. It is a nice park and there are some good hikes and views to be had but I just always seem to come out with fewer quality images versus the other two parks. Besides creating photographs, this park offers a couple good hiking trails and from what I hear some decent fly fishing!! If you're photographing this area, and you have some extra time, definitely stop by this park to create some photos! Just three miles from Dexter-Huron Metropark is my favorite of these three parks, Delhi Metropark. It is by far the smallest of these parks at just 53 acres in size. Though small in land size it makes up for it in photographic opportunity. When you arrive at this park, again from beautiful Huron River Drive, you will cross the unique one-way Delhi Bridge over the river. As you're crossing the bridge take a quick glance to your right and you will see why this park is an incredible place to photograph. It is just north of this bridge that the beautiful Huron River hits some rapids. Yes, they're subtle compared to some rivers in the U.P. but when the water level is just right they are simply fantastic to view and fantastic to photograph. If you ever decide to photograph this part of the river you have to do yourself the favor of shooting from both sides. That means that you'll want to walk across the bridge and head down into the forest along the banks of the river(again north of the bridge) where you can find a small trail that leads you along the river. Take your time and watch the light because it reflects beautifully off the river. Thanks for taking the time to read the latest blog post on the Fine Michigan Photography Blog! If you're new to the Fine Michigan Photography Blog and want to receive future updates simply fill out the form below. Have a great day! The beautiful Huron River flows just north of the Delhi Bridge. The latest 'Photographer Profile' on the Fine Michigan Photography blog features a great photographer and one of the nicest guys I know, Walter E. Elliott. Walter is from my neck of the woods(Grand Haven) and it's always a pleasure seeing him in the field and seeing the images he creates! Read on to see some of his great photos and learn a little more about the man behind the camera! Why do you love photographing Michigan? Michigan has so much to offer! The Great Lakes, rivers and streams, waterfalls, dark skies, beautiful landmarks and historical cities, farms and fields, cultural festivals, Native American heritage, and the list continues. An added bonus: the opportunities become fourfold with the addition of the seasons. A lifetime is not enough to experience the wonders of our great state! How long have you been photographing Michigan? Although my first experience in photography was in the 1980’s, after a long hiatus I started photographing Michigan in June of 2014. After the hiatus, what lit the fire for you? A few friends were very encouraging to me, saying that I had an eye for composition. After asking if any of my friends had a camera I could borrow, one agreed to lend me his Canon T2i on a trip to the U.P., and that brought back the joy of photography. Even though we didn’t have the extra money at the time, my wife encouraged me to buy my own DSLR, and it has been an incredibly fun journey ever since then! Social Media has definitely changed photography, do you like the effect social media has had on photography? I primarily like what social media offers photography. The ability to share my work and see other photographer’s work from around the world is amazing. Anyone can travel without leaving home. It doesn’t replace physically being there, but it opens doors to places people would otherwise never know - and that’s inspiring! Even though the blatant theft of images has become a problem, I believe the good outweighs the bad when it comes to social media. What is the most dangerous situation you've been in while creating images? Probably the most dangerous situation was during a storm in August of last year. The lightning was incredible, but probably too close for comfort. While I enjoy shooting as a storm travels across the lake, when it is close to land I usually pack up the gear and go home. However, it was hard to leave on this particular night, and I found myself saying, “One more.” When one cloud to cloud lightning strike occurred, it felt as if my hair should have been standing up. That’s when I realized it was definitely time to leave! How did you first end up behind the camera? My sister-in-law gave me a Canon AE-1 in the mid 80’s. One of my High School teachers offered a photography class in the evening, so I decide to give it a shot (pun intended). After a few years of trial and error (mostly error), and a lot money spent on film and development, I decided it was time to try another hobby. My passion for art and composition never faded, however. I’ve enjoyed the work of other photographers over the years, so a few years ago I once again pursued the joy that photography offers. What photographers have influenced or inspired you the most? I am influenced by any soul brave enough to photograph a moment. Everyone is an artist, and everyone has a story to tell. I don’t care about the technicality of a shot as much as the intent of the artist. I learn so much from what other people have to say through their visions. When I was young my uncle had a big influence on me. He worked for the government in Connecticut and was also a part-time photographer. When he visited he would show slides of the East Coast at family gatherings. Where is your favorite place in Michigan to shoot? I have two favorite places to shoot in Michigan: The Lower Peninsula and the Upper Peninsula. 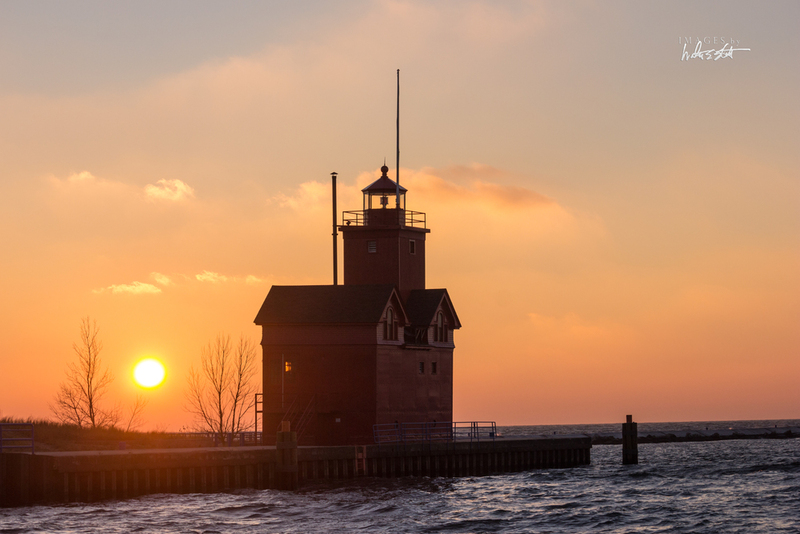 I live minutes away from Lake Michigan in Grand Haven, so many of my images contain local lighthouses and sunsets - Holland, Grand Haven, Muskegon, and Whitehall/Montague to name a few. When I have the opportunity to travel, I usually like to go as far as I can. Grand Marais, Munising, and Copper Harbor are a few of my favorite stops in the U.P. I’ve been visiting at least once a year for the last twenty years, and I continue to find something new and incredibly beautiful every time! It’s very difficult to name one or two places as my favorites, especially since I have so many more places to discover. If you had to shoot somewhere in the U.S. other than Michigan(or the Great Lakes Region) where would it be? California. I lived in San Francisco for two years while I was finishing my Masters degree and was able to discover the beauty of the Pacific Coast. Some places were obvious, like Monterey, the Redwood forests, and the Golden Gate Bridge. However, I was also able to find some of the hidden gems such as Alamere Falls, a waterfall that flows into the ocean. California offers a variety of climates and terrain, from foggy and damp to dry and barren, mountains, valleys, rivers, and an ocean, and everything in between. There is so much to see and I would like to spend a few weeks there with my camera! Do you have a personal favorite image and what draws you to it? My favorite is any image with lightning. To record a moment of sheer power and energy and be able to relive it by looking at it humbles me. It gives me the perspective that there are things in our lives that are beyond our control, and in a strange way that is consoling. What is your favorite season to shoot? My favorite season(s) to shoot are spring and summer. The primary reason - thunderstorms! If I had to choose one situation to shoot, without a doubt it would be storms. The raw energy and power coupled with the unique beauty leaves me in awe. The warm weather is also a factor. Winter is beautiful as well, but the pain of thawing fingers and toes is a hefty price to pay. I value the solitude of a winter evening/night, but enjoy the warmth of a summer breeze under the stars much more. Thanks for reading the latest 'Photographer Profile'!! Be sure to follow Walter and his beautiful photographs on Facebook, Instagram and at www.WalterEElliott.com! Sign up below to receive future newsletters and blog updates from Outdoor Imaging by Brad Terry! A little over a year ago I decided to start the "Fine Michigan Photography Blog" and write about photography(and photographers) in the Mitten State. Along the way I've run into some difficulty deciding what to write about(writing isn't generally "my thing") and that was the case recently. After some thought it occurred to me to write a "mini-series" on a few of my favorite places to shoot! Naturally, I decided to start with the best....... Michigan's Upper Peninsula! I'll be sharing another post from "My Favorite Places" Series next month! It's impossible to be a landscape photographer in Michigan(or anywhere in the Midwest for that matter) and not want to shoot in Michigan's beautiful and majestic Upper Peninsula. It is a land that can go for miles and appear to have never been walked upon by human feet. With old growth forest, pristine waters and gorgeous waterfalls it is a photographers dream. Even without a camera in hand just exploring and taking in the beauty of Michigan's Upper Peninsula is a thrill! Read on to see images from some of my favorite spots from the Yoop! 'Last of Autumn' - Bond Falls. Bond Falls State Park is a very popular destination for folks looking to find the beauty of the U.P. The falls are located in Trout Creek and is about a 5 hour drive from the Mackinac Bridge. 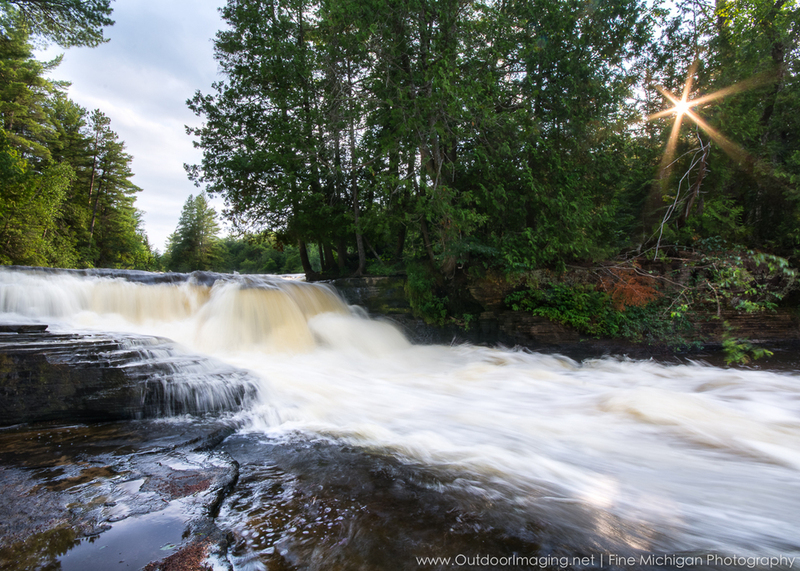 The Ontonagon River is the source of the falls which tumbles a total of around 50 feet. At only 90 acres in size the Park is not large but it's certainly well worth the trip! One my absolute favorite places in the Upper Peninsula is also one of the most unassuming. Canyon Falls appears as a Roadside Park along US 41 south of L'Anse but once you take the easy 1 mile hike to the falls you realize it's anything but ordinary. The beautiful Sturgeon River flows through gorges and canyons that seem foreign to Michigan. Hiking along the river and creating images of the beauty that surrounds it make it a must see area for the U.P. This park is a little less than 4 hours drive from the Mackinac Bridge and it is definitely worth exploring! About 5 hours from the Mackinac Bridge is my absolute favorite area of the U.P., Porcupine Mountains State Park. With nearly 60,000 acres this large park offers great hikes, great views and great photographic opportunity! Lake of The Clouds is the most well known location within the park and is a must see. But for me the gem of the area is the Presque Isle Scenic Site. Tucked into the Northwest corner of the park, the Scenic Site allows for fantastic hiking and views along the rugged Presque Isle River. With a short and beautiful hike you can view Nawadaha Falls, Manido Falls and Manabezho Falls and then simply stroll to the shores of Lake Superior! This park is an absolutely amazing place and if you haven't been before and are within a few hundred miles you need stop by!! Last but not least is Tahquamenon Falls State Park. Everyone knows about Tahquamenon and nearly everyone has been. I recently and somewhat reluctantly returned to this park last Summer(You can a read a post about that trip here). With the Upper Falls being the second largest falls west of the Mississippi River and having a Brewery on site, it is a very popular tourist destination. The Upper Falls are beautiful but my preference is to take a canoe to the island where you can view the Lower Falls. The hike around the small island is beautiful by itself but couple that with surrounding cascades from the Tahquamenon River and your day and trip will be filled with serenity. If you haven't been(and you likely have...) the relatively quick drive from the bridge - about 1 hour - is one you must make! You won't be disappointed, even if you planned on it like I was!! There ya have it! A few of my favorite stops in the U.P. Take a look through the slideshow below to view a few more Upper Peninsula pics! And you can save 15% on all the images from this post - just use promo code UP15 at checkout!! And also feel free to comment below on your favorite U.P. locations!! Hey guys!! It's time for another 'Photographer Profile' and this time around the talented Dan Frei has been kind enough to answer some questions! So read on and ENJOY! How long have been photographing Michigan? I’ve been photographing Michigan professionally for the past four years. Prior to that, I just had a camera while on trips with family and friends, but most of those trips were out of state. Growing up in mostly big city areas of Michigan, I had no idea such beautiful landscapes existed in Michigan. It wasn’t until just over four years ago when I took a camping trip with friends to the UP that I realized how beautiful and dynamic the landscape was. I fell in love with every part of Michigan I’ve visited since. How did you first end up behind the camera? This is kind of a long story. I first enjoyed taking pictures when I was in the 6th grade on a class camping trip. I’ve owned a camera ever since and took it on every trip I went on. However, that wasn’t where my passion for photography began. Prior to being where I am now, I was a highly technical IT Engineer. I was known by some as “Freibot” because of my robotic, heavily-weighted left brain mindset. Anyways, I loved gadgets and technical gear, so I bought a DSLR and I thought it was fun. In 2010, my wife and I had twin girls and we made the decision to have me be the stay at home dad. Since being surrounded by nature was therapeutic to me, I would go there when I needed to get out of the house and I would bring my camera with me. I began taking pictures and exploring the right side of my brain. Doing this, along with entertaining toddlers, made me realized I actually had a functional “right brain”, and I wanted to explore it more. This is how I ultimately ended up behind the camera. Why do you love photographing Michigan? It has everything. Hundreds of waterfalls, vast forests, endless trails, thousands of miles of diverse shoreline, caves, towering dunes, cliffs, mountain tops, more than 100 lighthouses, and all with four seasons to view them in! To top it off, there is significant history behind almost all of it. If the land could talk, oh the stories it would tell. Where is your favorite place in Michigan to shoot? I can’t narrow it down to any one specific location, but all of the Upper Peninsula is my favorite place by far. It has everything and it has four full seasons of it. It has mountains, waterfalls, rocky shores, dense woods and sandy beaches. It even features grand overlooks, winding roads and cozy caves. The UP is a photographer’s wonderland. What is the most dangerous situation you've been in while creating images? This is easy. Last winter I went out with a few others to Port Austin to capture something we hadn’t seen before: Turnip Rock at night. The night we went ended up being downright cold. The hike out wasn’t bad because of the anticipation and excitement we had of photographing Turnip Rock. Once we got there it was a frenzy of picture taking, but once the excitement wore off and we were done firing off a few compositions, we got cold and the single digit temps started to his us hard. We planned to stay and catch a sunrise but we started to wonder if we were going to make it. All of our water bottles froze so we had nothing to drink. Multiple handwarmers weren’t enough to keep our hands and feet warm. We found ourselves pacing back and forth across a frozen Lake Huron trying to stay warm, waiting for the sun to come up. Once it did, we snagged our sunrise shot and headed back. We were dehydrated and frozen, stopping many times on the way back because we were cramping up. A few of us even needed help walking by the end of the hike. I had joked prior to leaving that we should bring a sled just in case. Little did I know we would actually end up needing it. Do you like the effect social media has had on photography? I think social media is great for photography. It gives anyone the platform to be seen and shared. Without it, I wouldn’t be answering these questions here today. When I shot the northern lights over the Mackinac Bridge this past March, I got home at four o’clock in the morning, posted one photo to Facebook and went to bed. I woke up to hundreds of comments the next morning and by the end of the day that photo had been seen by millions of people with newspapers, TV stations and random people contacting me about the photo. That would never have been possible without social media. It has also connected me with so many other photographers who have helped me or I’ve been able to help, all from the privacy of my own home, which is important to me, being a stay at home dad. It comes with its downsides though. Aside from anyone and everyone taking pictures and trying to be seen in the crowd, it can be time consuming. From Facebook, Instagram, Twitter, Pinterest, Flickr, 500px, the list goes on and on. It can be real tough to keep up. If you had to shoot somewhere in the U.S. other than Michigan(or the Great Lakes Region) where would it be? It would have to be the Big Sky Country in Montana. I love being in the woods and exploring them, and Montana has so much of it. It has mountains, waterfalls, forests and very little population to mess with it or me. What photographers have influenced or inspired you the most? There are a few. We’ll start with Ian Plant. I found him by reading his articles on Outdoor Photographer and later his blog. On his blog I was introduced to Richard Bernabe, Kurt Budliger and Joseph Rossbach. These guys all shared the same idea in everything they wrote. It was your composition of the scene, not necessarily the settings, that made the shot. It was through these guys that my photography moved from my left brain to my right brain, and that was where my photography really started to take off in my opinion. From there I was inspired by local photographers Karl Wertenan and Neil Weaver. Karl not only introduced me to night and long exposure photography but also inspired me to take my time, setup, compose and calculate my shots before I take them. And Neil Weaver because of the way he sees a scene. Not only can he shoot the icons, but he can take an average scene and create something amazing with it. Seeing him do that inspires me to try to do the same. What photography books/blog/videos are you currently referencing? Aside from the Fine Michigan Photography website at outdoorimaging.net, not really referencing anything currently. If I could choose something else, I would say I’m referencing people. My recent focus has been connecting more with the photography community. Reaching out to actual people. I have people contact me all the time asking questions regarding how to take certain shots, what kind of gear I recommend, and where some of the locations of my shots are. Some just want a little encouragement. With me starting up photography workshops, this has been great learning material for me. As well, I’ve been reaching out to others and learning from the things they are doing well. I’ve been able to learn more about the business and marketing side of the photography business than I otherwise would have. What is your favorite season to shoot? Although I truly love the fall season and the colorful splendor it brings, the last two winter seasons have me leaning in that direction. My top memories from photography have happened in the bitter cold of the last two Michigan winters. Everything turns to a winter wonderland. Most people won’t go out when it’s really cold, and that’s when you can find no footprints in the snow, no external modification of a scene, no people in your shots, and you can hear the sounds of the season and immerse yourself in what you are doing. There is nothing to contend with except the elements, you just have to dress accordingly. That wraps up another 'Photographer Profile'! I hope you enjoyed reading about Dan and viewing his beautiful photographs!! Please take a moment and follow Dan on Facebook, Twitter and Instagram - you certainly won't regret it!! If you'd like to receive updates on future blog posts and receive the Outdoor Imaging Newsletter, fill out the form below! I recently showed my son a book of images and stories by the late Galen Rowell. My son is only 4(well almost4) so he didn't truly understand what he was looking at but to my delight he did seem fairly interested. However, being almost 4 years old means he didn't put the book away when he was done with it and it turns out that was actually a very good thing. I saw it laying on the floor and decided I needed to take another look through it myself. And while going through the pages and looking at Galen's beautiful images and reading stories about him I came across something he said, "My interest in photography did not begin with books or mentors, or with any burning desire to see the world through a camera. It evolved from an intense devotion to mountains and wilderness that eventually shaped all the parts of my life and brought them together. Photography was never simply a hobby or profession for me. Once I began taking pictures, it became an integral part of my life." It was the last part of that quote that got to me, "Photography was never simply a hobby or profession for me. Once I began taking pictures, it became an integral part of my life." You can see in his images that the word hobby never would have been an accurate description. But maybe more important than that is when he says "it became an integral part of my life". If photography is that important to you than it's not a hobby. I feel if you want to move your photography forward then it's important to stop calling it a hobby. Call it what it is - whatever it is for you. For me it's a lot of things but most importantly it's love and therapy. I love the opportunity photography gives me to get out into nature and appreciate what we have. I love that it allows me to create something that is mine. I love that it gives me something to share. But maybe most importantly photography is my therapy. If I'm having a bad day, a bad week or a bad month reaching for the camera and creating images is always therapeutic. It gives me an escape and lets me clear my head. When I'm creating images all my troubles, as big or as small as they might be, just seem to roll away. Hobbies are something we do to pass the time. I don't take photographs just to pass the time, do you? Calling photography a "hobby" just seems insulting for something so important to me and I'm sure if taking photographs is important to you, then you feel the same way. Call it a passion. Call it an escape. Call it love. Call it therapy. Call it reconnecting. Call it a dream. Call it what it truly is to you - but don't belittle what it means to you. It means a lot to me and if you tell me it's a hobby you'll have to excuse me when I correct you. Ahhh, the age old question: If a tree falls in a forest and no one is around to hear it, does it make a sound? This is the question that came to mind when I saw recent post on Facebook and I asked myself, "If you post an image on Facebook and it receives no likes, should you quit photography?" A photographer had posted some recent images on Facebook and noted that no one seemed to be "liking" them and asked in his post if he should stop creating photos all together. This photographers' images weren't bad - they weren't particularly great(but that's a matter of opinion I suppose) - but they certainly weren't bad. I was tempted, but refrained from responding with a one word answer. Yes. Yes you should quit creating images. If Facebook is seemingly telling you nobody likes your photos and you think that matters, then yes, please stop. You clearly don't have "what it takes" to be a photographer and there are plenty of other photographers out there willing to fill the void you leave. Photography isn't about Facebook "likes" or being "Retweeted" on Twitter or having an image "Plussed" on Google+(which I think is still a thing). It's not about how many "fans" you have or how many prints you sell - yes all those things are good - but that's not what it's about. It's about how photography makes you feel and sharing that with the world - whether they "like" it or not! It's about being out there in nature(or wherever you choose to create images) and the only thing in your world in that moment is you, the camera and the landscape in front of your lens. It's about doing something for the pleasure of it and doing it, foremost, for yourself. You have to have "thick skin" and know that you're starting from the bottom and that climbing your way up can take a long, long time. You have to know that you're going to fail. If a photographer tries to tell you that they don't fail or haven't failed at some point in their photographic career then find another photographer to talk to because that one's lying! I fail. I fail all the time. I publish images that are "duds". All the images in this post received little or no attention on social media and I have sold few, if any, prints of these photos. But that's ok, that's not what it's about! The thing about every photo in this post is that I enjoyed creating them. Sure, I hope you like them too, but you may not and that's perfectly fine because to me they are valuable. There are photographers on Facebook, Michigan Photographers, who have 10, 20 even 50 times the amount of "fans" that I have!! Do I wish I had more fans? Yup. Does it matter that I don't?? Nope. It's not a popularity contest. The amount of "fans" or "likes" or "retweets" does not make a good photographer, it might make a popular photographer but not a good one. I've seen plenty of photographers with 20,000 fans that aren't nearly as good as some that I've seen with 800 fans! If you focus on being a good photographer - whatever that means to you - the popularity will come eventually but you have to have "what it takes". And if you think that simply getting "likes" is what it takes then you're in for a rude awakening. Now if you're reading this thinking, "Who the hell is this guy to think he has all the answers?!!? ", trust me I know I don't. I still consider myself to be on the lower rungs of that ladder(and still constantly question if I have "what it takes") and I know I may never get to that ultimate destination. But I do know this, if I base my success solely on how many "likes" my photos receive and if I didn't accept my failures and I hadn't learned from them, I wouldn't even be on the ladder. So, if a photographer posts a photo and and nobody likes it, is he or she still a photographer? Yes. If they choose to be. Sign Up Below To Receive Updates On Future Posts! Thanks! I promise not to bug ya too much!! The latest 'Photographer Profile' features the talented Aubrieta Hope! Aubrieta is a scenic photographer and writer - featured on michigan.org and northlandadventurer.com - with a special interest in northern Michigan. While technically an Illinois resident(yeah, yeah, it's the Fine Michigan Photography Blog but read on and you'll see why she's a great Michigan photographer! ), her beautiful photography and inspiring writing about the Mitten State have garnered her "honorary" resident status among many Michiganders(myself included). Thanks for reading the latest 'Photographer Profile'! Enjoy! Why do you love photographing in Michigan? AH: I'm drawn to Michigan because it offers everything I love most: crashing waves, sandy beaches, lighthouses, rocky cliffs, sea caves, northern lights, waterfalls, and winter. For me, it's a head-over-heels thing! By the grace of God, I've been "homesteading" in various northern Michigan campgrounds with my tent for nearly 20 years. In summer, autumn, and winter, I leave a perfectly good house in northern Illinois for weeks at a time to travel to the Upper Peninsula and northwest Lower Peninsula. Where is your favorite place in Michigan to shoot? AH: My favorite places include: the beaches and overlooks of Sleeping Bear Dunes, the weathered farmsteads and rolling hills of the Port Oneida Rural Historic District, the southern shores of Lake Superior, the Munising area, the Porcupine Mountains, and Tahquamenon Falls. What is your favorite season to shoot? AH: I like shooting at all times of the year, but especially during those transitory periods when weather and seasons collide, as when snow falls on autumn leaves or when the sun spotlights the landscape in the midst of a storm. I love all the seasons of the moon, especially when the night is clear. 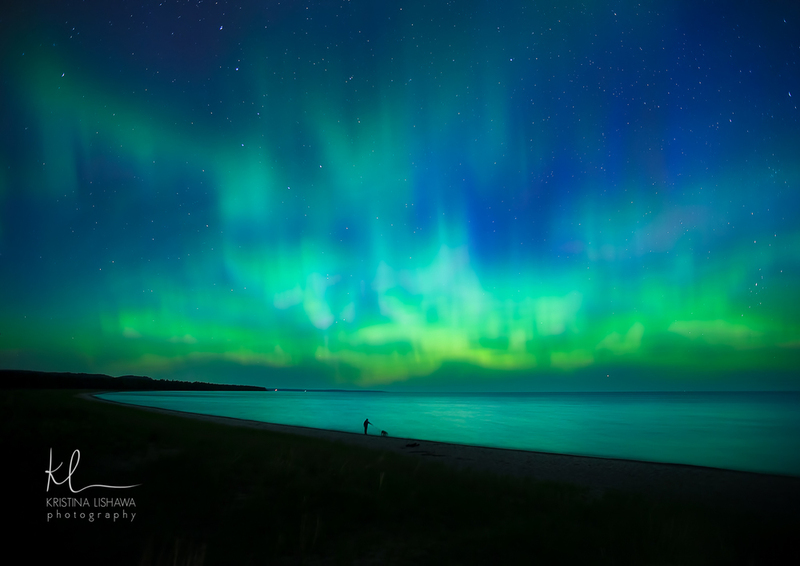 The beauty of Michigan's dark skies, bright stars, and northern lights mesmerizes me. What is the most dangerous situation you've been in while creating images? AH: Ordinarily, I take every precaution to avoid dangerous situations. Except, that is, when I pick up a camera. With a viewfinder to my eye, I feel ten feet tall and bullet-proof, like Clark Kent after he went into the phone booth. I lose track of key personal safety details, such as where to locate my feet. I go off trail, wander onto thin ice, or get too close to the edge of cliffs. At a shoot, I'm usually the one with swamped boots and skinned knees. Last June, while photographing the northern lights at beautiful Lime Lake, I managed to fall into the lake. Fortunately, no cameras were harmed in the making of any of those photos! I carry lots of flashlights, so I usually feel safe in remote areas, my long history of misadventures notwithstanding. However, I do recall an evening that I felt pretty scared, and I wasn't even lost. It happened in February on a two-track in an isolated area of Sleeping Bear Dunes. I had just finished shooting the sunset at Lake Michigan and was snowshoeing back through two feet of snow. I was making pretty good progress when I spied fresh boot prints. My heart started racing as scary thoughts flooded my brain. Who else could be out here? (My camera was in the bag, so I wasn't feeling invincible; I was back to being Clark Kent!) Just as I found the pepper spray in my pocket, a long, powerful creature appeared about 15 yards in front of me. The cougar never looked my way, but slowly crept across the two-track and slipped into the woods. If the temperatures had not been sub-zero, I might have retreated to the beach. Instead I froze in place like a photographer statue, holding my tiny can of pepper spray. And then, I snowshoed like Superman back to my car. What photographers have influenced or inspired you the most? AH: I'm most influenced by the outstanding Michigan photographers I've met on the trail by chance or happenstance. They've taught me a great deal, just by their example (and also by answering my 5,000 questions). These include: Neil Weaver, Craig Sterken, John McCormick, and several others. Shooting with other photographers in the field is a wonderfully serendipitous way to learn. For daily online inspiration, I look to my fellow members in the Traverse Area Camera Club (TACC). We follow each other's photos and share knowledge - even in the middle of the night if the northern lights are happening! 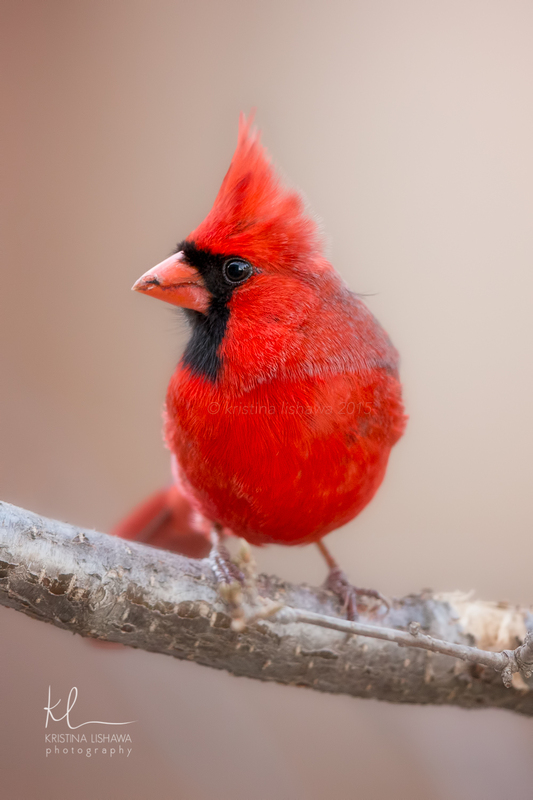 Last but not least, I'm inspired by the work of John & Barbara Gerlach (Gerlach Nature Photography). Much of what I know about photography I learned from their field workshops (in the Upper Peninsula) and their books (published by Focal Press). How did you first end up behind the camera? AH: Nearly every good thing that's happened in my life somehow evolved from a difficult experience. Photography is no exception. When I was a kid growing up on the farm, I loved taking pictures with my Kodak 110 Instamatic. But I dreamed of becoming a writer, so after I graduated with a degree in English, I started a freelance writing and editing business. I ran that business for 15 years until a sunny afternoon in May when a drunk motorcyclist ran a stop sign. After the crash, I was encouraged to pursue work that used the right side of my brain, a place I'd hardly visited since I set aside the Instamatic. It was a turning point for me. AH: I started taking photography seminars and workshops about 19 years ago. The learning process has been anything but rapid! Other photographers tell me that they see the world in terms of pictures. But, I'm primarily a word person. I look at a scene, and I hear sentences in my head. Maybe that's why it takes me longer than most to compose an image. I have to find the carrier pigeon in my head to carry the message over to my right brain, where it's translated into a picture. The silver lining to this cumbersome process is that, hopefully, my pictures wind up with lots of words in them. For me, it's always about the story! Without a story, even Photoshop can't save the picture. Since I shoot from the heart, it's sometimes tough to fit all the words of a scene into a picture. I write articles to catch the words that didn't land on my camera's sensor. Links to all of my published articles can be found on my website, www.michiganscenery.com. Do you display your work in Michigan? AH: Over the years, I've developed a line of souvenirs featuring my northern Michigan images. My playing card decks, photo magnets, picture postcards, and other souvenirs can be found at various shops throughout Michigan. I also sell my souvenirs direct to the public through my website, along with my fine-art prints, canvas gallery wraps, and vivid metal prints. During the tourist season, Petoskey Pete's in Glen Arbor displays and sells my prints as well. If you had to shoot somewhere in the U.S. other than Michigan where would it be? AH: That's easy: Texas! I love its vast expanses of wilderness, especially the scenic river canyons of the Hill Country, the shining beaches of the Gulf Coast, and the desert landscapes of West Texas. Read some of my favorite blog posts by Aubrieta here, here, here and here. What's in your camera bag? AH: I tend to be a little over-stocked on gear when I load the car for a Michigan trip. My friends say I could easily open a photographers' supply dispensary on location because I carry so many extra filters, lens cloths, flashlights, gloves, etc. In the (not entirely) unlikely event that I might experience calamity while out of cell range, I also carry a DeLorme satellite rescue beacon and plenty of Bandaids. Well, after reading this profile I'm sure you understand why Aubrieta is considered a great "Michigan Photographer"!! I would like to thank you for reading the latest post and I would also like to thank Aubrieta Hope for participating in this project! Please take a moment and check out more of her amazing work at her website, www.michiganscenery.com, her Facebook page and her Instagram page! Enjoy a few more of Aubrieta's great images in the slideshow below! If you enjoyed this 'Photographer Profile' and want to stay updated on future posts sign up below to receive the Newsletter! Oh man!! The photographers are getting giddy! Why?? Because it's fall in Michigan!! We may claim other seasons to be our favorite to shoot in but nothing gets us as excited as the prospect of Autumn colors! And I just wanted to take a minute and share a few favorite images of mine and a few from a couple other Michigan(and 1 almost Michigan) photographers! Presque Isle Scenic Site. Porcupine Mountains State Park. Jason Miney created this beauty of an image at Lake Of The Clouds in the Porcupine Mountains and that sky is amazing! Jason answered some questions for a 'Photographer Profile' and you can read that here. Neil Weaver went all the way up to Copper Harbor to make this stunning photograph! Hardly seems like it can be from Michigan! Read more about Neil in the first ever 'Photographer Profile'. Craig Sterken rappelled down the side of a cliff to create this photo of the Carp River in the Porcupine Mountains! (I may have lied about the rappelling thing..) Check out Craig's 'Photographer Profile' here. The Michigan Nut, John McCormick, always seems to capture fall colors at their best! This amazing image is from Bond Falls and John has more beauties to share from Fall on his website! Read more about John in his 'Photographer Profile'. While not a full time resident of The Mitten State, Aubrieta spends much of her time in our great state. And with photos like this from Sleeping Bear Dunes National Lakeshore we don't mind calling her a Michigan photographer!! Stay tuned as there will be a Photographer Profile with Aubrieta Hope in the very near future! All the photographers above have links to their websites and Facebook Pages below their respective images. Please check out their work as I guarantee that it is time well spent!! While I may be missing peak color in the U.P. it certainly doesn't mean that I won't have the camera at the ready! Be sure to stay tuned to my Facebook page, your email inbox and of course this very website to see what Fall Colors I capture this year! Thanks for taking the time to read this quick post and feel free to stick around and checkout the slideshow below to view personal Fall favorites of my work! Feel free to add your name to Newsletter list and stay up to date on new blog posts! "Grand Haven Pier and Sunset"
Now that that is out of way I'll go ahead and take a guess that you did not actually download this image to your computer. Why not? On another wild guess, I'll assume you didn't do it because you are a decent person and have respect for other peoples' work, most people do(or maybe you just don't like the image). So why all this hubbub(yes, hubbub) about stealing my photo? Well, in the new digital/social media age taking someone's work has become amazingly easy and it gets kind of annoying. Photographers(all artists really) put in a lot of time, effort and money into their craft. So when someone takes our work and shares it as if it were their own - like this person on Twitter - we get a little upset. But that fake Twitter has nothing on this jerk - here - who takes Instagram images adds a comment, takes a "screenshot" and claims that it is his "art" and then sells them for tens of thousands of dollars(he's been to court before and has won). Now to clarify, I'm NOT talking about using the "Share" button on Facebook or the "Retweet" button on Twitter - we love these - they give us credit!! I'm talking about downloading an image, cropping off the watermark, sharing it and not giving the artist credit. Not only is it annoying but it also happens to be illegal. It may seem like a small thing to do but it is in fact Copyright Infringement(learn more about copyright here). But as photographers what can we do about it? It seems not much. We can(and have) reported these practices to Twitter and Facebook and wherever the offense is occurring. The social networks do next to nothing to combat these folks and don't seem to care much if our copyright is being infringed upon. But let's face it, we're small potatoes to these huge corporations. We could, I suppose, call a lawyer and have them do whatever it is lawyers do, but lawyers cost money and we're artists - we're broke! We could act in kind and "spam" the culprit accounts with constant nagging and CAPITALIZED angry empty threats but that likely won't get us anywhere either and is simply stooping to their level. So unfortunately, for now at least, we are stuck with pretty much zero good options for keeping people from stealing our photos. However, I like to look at things from more than one angle. Yes, it stinks that people are out there stealing my work and not giving proper credit but how much does it really effect me? There's realistically no way to tell if these people are making money off my work but I doubt they are. I think what bothers me most, or did, was the fact that the Twitter account I mentioned earlier(and there are others) has 40,000 followers. That's a lot. That's 40,000 people that are seeing my photography(and many other great Michigan photographers images as well) and have no idea that I'm the one who created that photo that they just favorited or retweeted or shared with their friends. That's 40,000 potential customers! But..... it isn't. If these people are willing to follow someone with zero credentials and an imitation account, then it's 40,000 people that were likely never going to buy anything from me anyway. It's 40,000 people that don't care about the craft of photography and have no interest in investing in any form of art. And since I am someone who does appreciate the time, the sweat, the miles driven, the miles hiked, the equipment purchased, the equipment ruined, the hours in front of a computer, the frostbit toes, the nights in hot tents, the nights in cold cabins, the hours spent on a layover, the hours spent on setting up and tearing down for art festivals(even when you make no money) - because I appreciate all these seemingly small(and almost always unseen) things that add up to be our craft is exactly why I'm not worried about those 40,000 people who have no appreciation for those same "small" things. They don't get it. They likely never will. Sure, I wish these fake accounts didn't exist and people didn't steal our images and people didn't follow or like those who do steal from us but they do exist and they likely always will. So as frustrating as it may be sometimes I'm going to try to not let it bother me(ok infuriate me) anymore. I'll let them do what they do and I'll just keep trying to create the best photographs I can for those that do appreciate all the effort that goes into my photography. Thanks, I needed to vent a bit. Now please go support your local artists! If you're new to the Fine Michigan Photography and want to stay up to date on future posts(they're usually much lighter than this) fill out the form below to receive email updates. You may know him as Michigan Nut Photography but the man behind the lens for all those beautiful photos that you've enjoyed over the years actually goes by John McCormick. He was kind enough to share some thoughts(and of course some of his gorgeous photos) with The Fine Michigan Photography Blog for the latest 'Photographer Profile'. 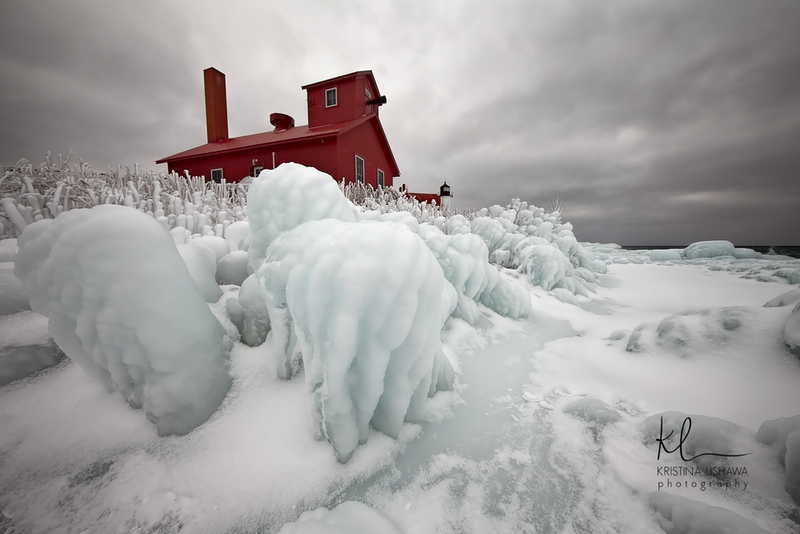 So read on and find out a little more about one of Michigan's finest landscape photographers! Many people know you not as John McCormick but as “Michigan Nut Photography”. Is there a story behind how you came up with the name? And what was the inspiration behind your great logo? Not really much of a story behind how I chose the name, just that I am "Nuts about Michigan". In regards to my logo, I asked my son Mike if he would make me one and design it the way he wanted. Mike knows that I love to shoot Michigan lighthouses and that it's a large part of my portfolio, so he made me a cool silhouetted lighthouse logo with a sunset behind it. How long have you been photographing Michigan? I started getting interested in photography when I was pretty young, my father had a German made 35mm camera that he brought home from overseas that I was fascinated with. It was around 1982 when I purchased my first single-lens reflex camera and started shooting Michigan landscapes as a hobby. Where is your favorite place in Michigan to shoot? There's beauty in all of Michigan, but I find myself drawn to the Upper Peninsula. 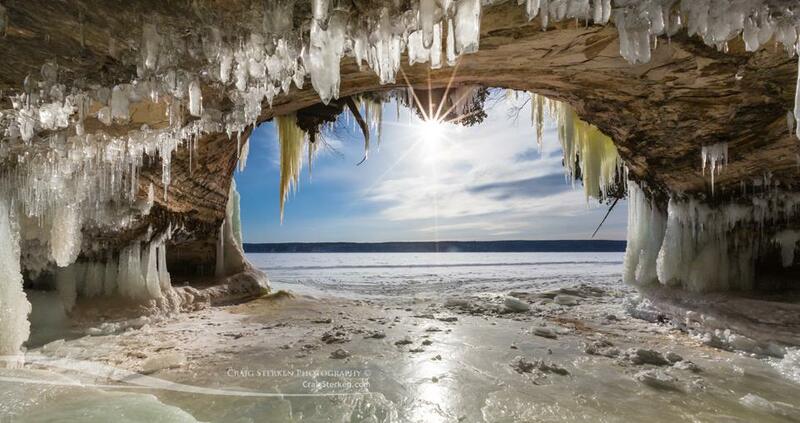 I especially like shooting at Pictured Rocks National Lakeshore. This area has everything a nature photographer could ask for; spectacular sunsets, 300 foot sand dunes, pristine rivers and streams, beautiful waterfalls, stunning rock formations and sandstone cliffs. Then I would say that lighthouses have been a big part of what I like to photograph. I really enjoy shooting them in late autumn when the storms are blowing in off of the lakes, and in winter when freezing spray encases them with a beautiful coating of ice. What is your favorite season to shoot? -- Autumn is my favorite time of the year to shoot, for obvious reasons, but winter is very close second. Winter is magical, I absolutely love snow and when the storms move out, it reveals a "winter wonderland” I’m then in my element of silence and solitude. Having been a photographer for so long you certainly started out with a film camera, is there anything you miss about shooting with film? I respect photographers who still enjoy traditional film based photography, but for me personally there's really no aspect of it that I miss, with the exception of how solidly built the 35mm SLR camera bodies were. They really felt nice in your hands; the controls were smooth and precise. Today’s pro cameras are built well too though, just a different feel. Why do you love photographing Michigan? OK, I'm going to borrow from my website’s “about page” to answer this question -- Some Nature photographers say Michigan has a lack of scenery. What they’re missing is a wilderness that stretches along miles of Great Lakes shoreline. Nowhere in the United States will you find an area that more reflects the dramatic seasonal changes, beautiful winters, colorful autumns and springs. It's a landscape continually changing. 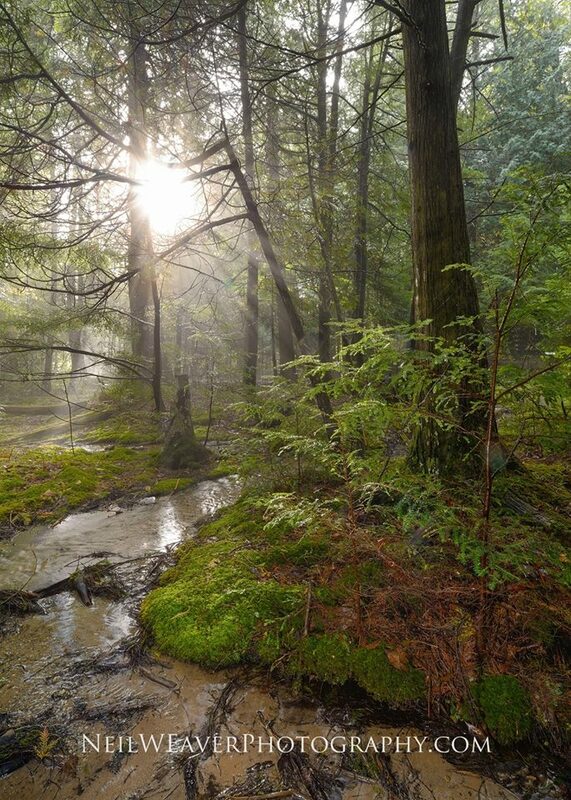 Michigan is beautifully diversified with forests and rivers, large wetlands, rocky ridges and sand dune shorelines. Topping all of that with over 100 lighthouses makes Michigan more than any photographer could ask for. It takes years to see the majority of what Michigan has to offer. What is the most dangerous situation you've been in while creating images? The most dangerous situation I was in was while shooting the Grand Island East Channel Lighthouse in winter. I had just opened my tripod, getting ready for the shot, when the ice broke plunging me into Lake Superior. My wife started running towards me and I yelled "stay back". The ice broke two more times as I tried to climb out but the third try I was able to crawl to shore. Shelly wanted to call 911 but I convinced her that my insulated underwear, and the fact that it was a sunny day, were enough to keep me warm for the trek back across Munising Bay. You have the largest archive of quality Michigan photos that I’ve ever seen! Do you have any personal favorites and what draws you to them? First off, thank you very much! I have lots of favorites but a few that I especially like are: Bond Falls in autumn, Point Betsie Lighthouse taken during a gale, and a sunset photo that I shot at the (Mary Jarecki shipwreck), Pictured Rocks National Lakeshore. The Bond Falls shot my wife was holding the umbrella above me and the camera on a foggy/rainy day. The Point Betise photo, I had to walk backwards up the shoreline because of the strong winds and sand that was pelting my face, and the sunrise was lighting the underside of the clouds racing by. The Lake Superior shot I had perfect conditions for a long exposure, beautiful soft light and it was taken the year that the lake was really low so the Mary Jarecki shipwreck was mostly above water. What photographers have influenced you the most? This is a really tough question. I'd have to say the photographers that have influenced me the most are the ones that back in the early 80's had published photography books or had written for photography magazines. One of the first ones that comes to mind, which I still have and still browse through from time to time, is "The National Geographic Photographers Field Guide" published in 1981 and authored by Albert Moldvay. The book jacket had a "gray card" that you could use for metering off of to help you overcome tricky exposure problems. Also, since digital photography emerged, and the numerous social networks on the internet, we now all get to view and be inspired by the work of an infinite number of talented photographers; photographers here in Michigan or anywhere in the world. I would also like to mention that my wife, our three sons and our daughter in-law Chrissy have been super supportive and have influenced my life in the most positive way! Do you like the effect social media has had on photography? (Does it make photography better or worse?) -- In my opinion social media and the internet in general have mostly been a boon for photography and photographers. Your work can now be seen around the world with a few clicks of a mouse. I've been posting images to the popular photo hosting site "Flickr" for a few years now, and those images as of today have been viewed by just under 4 million people, can't argue with that. In the past if you didn't have good connections or contacts, the chances for getting that kind of exposure were pretty slim. Without social media I believe my photography business would not be as successful as it is; not just for monetary reasons, but also the personal satisfaction I get from communicating with the fans of my work. I get messages almost daily from displaced Michiganders that are missing their home state, or others that just love it here and want to drop me a line. I personally know that you’ve been supportive and encouraging to the “new class” of photographers. Do you like what you’re seeing from the younger guys(not that you’re old by any means) and is there a piece of advice you might give someone just starting with photography? I do like what I see from the younger photographers. My advice for them would be to shoot and make your images in a style that pleases "yourself"-- photography is an art of expression. There's nothing wrong with being open to constructive criticism, but I have always felt that your "own" satisfaction from your work should come first. I use my own self-criticism as a guide for improving my skills. You’ve received quite a bit of recognition for you talents as a photographer. Does any one accolade stand out as a particular honor for you? It's exciting to see your image up on a billboard or published in a magazine, but it's quite an honor to have folks from around the country choosing to display my work on their walls. Speaking of recognition, where has your work been published? I have actually had my work published in a number of magazines and mediums - Lake Superior Magazine, Outdoor Photographer Magazine, N-Photo Magazine, Barefoot Magazine, Lens Magazine, Michigan Blue Magazine, Michigan's Bay LIFE Magazine, Traverse Magazine, Photography Week Magazine, AAA Living Magazine, Farm & Living Magazine, Delta Sky Magazine, Boys Life Magazine, Detroit Free Press, Lansing State Journal, National Geographic Education Dept., CNN Travel, USA Today, North Country Trail Association, Michigan's Travel & Recreation Association, Pure Michigan billboards, Michigan Lottery Charity Gaming Division, Michigan Naval Architecture & Marine, Michigan Dept. of Transportation (MDOT) and the Huffington Post. And finally the question that everyone wants to know - what's in your bag? Singh-Ray 4x6 Graduated ND filers in 2stop, 3stop, and a 3stop reverse. B+W 77mm screw on solid ND filters, 3stop and 6stop. Various other goodies- releases, polarizing filters, rocket blower, micro-fiber clothes etc..
To see more of John's work visit his website at michigannutphotography.com and of course be sure to follow him on Facebook, Instagram and Flickr. John McCormick, AKA "Michigan Nut Photography". And that wraps up the latest Photographer Profile! A big thanks to John McCormick for taking the time to participate in this project and an even bigger thanks to you guys for taking the time to read this post! Be sure to fill out the form below to stay up to date with The Fine Michigan Photography Blog! Tahquamenon Falls: It's a (tourist) Trap!!! What defines a "Tourist Trap"? We all probably have different ways in which we define what constitutes a tourist trap. For me, I identify the tourist trap with one simple machine. The penny flattener. I'm sure everyone has seen these at the zoo, the amusement park or even at Prehistoric Forest(yes, that's a 'Tommy Boy' clip). You put in 50¢ and in return you get a flattened, monetarily worthless penny - what a scam! I know, I know, I'm being a bit cynical and to some the flattened penny is a token or memory of a place they visited and truly loved. But to me it easily identifies a place as a tourist trap. In the beautiful, dense and pristine forest of Michigan's Upper Peninsula you can find a place that sells Buffalo Burgers, Micro Brews and yes, flattened pennies. This place is called Tahquamenon Falls State Park and by my simple definition, it is a tourist trap. I had been to this park once before and was a bit frustrated with how "touristy" this spot was. So when I decided to start the Parks Series I was reluctant to put in on the list of parks that I would visit. However, being one of the most well known and most visited of the Michigan State Parks I knew I would catch grief from those who are following this series if I didn't include it. So when I had some free time in July I decided to head north of the bridge and visit this park. When looking at a map of Tahquamenon Falls State Park you can see just how large this park is. That's what was encouraging to me and helped remove some of the negativity I felt about it being a "tourist trap". The park actually consists of 2 seperate waterfall areas - the Upper Falls and the Lower Falls. When I arrived I stopped by both the Upper Falls and Lower Falls just to see how busy they were. And being July they were packed!! I don't like taking photos amongst crowds so I decided to head to Clark Lake(just north of the falls) and try to create some images there. You can access the trailhead to Clark Lake via a one lane dirt/sand road. When I arrived at the trailhead I was surprised to find that nobody else was there, so I took a quick bath in OFF Deep Woods with Extra Deet and headed off to find Clark Lake. The trail was nicely defined and the scenery was quite beautiful. The light was decent with some high clouds and nice blue sky. I clicked the shutter quite a bit while on this hike but was really only fond of the image I created above. After creating images at the Lower Falls for a while I decided I should probably go to the Upper Falls(the most recognizable) and create a photo or two there. The light was getting good and I wanted to create a good panoramic image. So I walked down the path and down the flight of stairs to get to the observation deck. By this time most of the tourists had gone so I had very little company on the observation deck, which was nice. I was able to create a panoramic image that I really liked(at the top of this post). Eventually the light left and I headed to the hotel to get some rest after a long day. The day was over but I certainly learned that a "Tourist Trap" might attract tourists for good reason - such as amazing natural beauty - and that if you explore a little bit and tune out some ambient distractions, flattened pennies aren't really a bad thing. Thanks for reading the latest post on the Fine Michigan Photography Blog! If you would like to receive blog post updates and the Outdoor Imaging Newsletter simply add your info to the form below! Thanks for your interest in Outdoor Imaging by Brad Terry! If you read my last blog post you might be expecting another 'Photographer Profile' because I told you that would be the next post. Well, I lied. I didn't mean to lie but I did. I didn't plan on writing this post but here it is. It's been 6 months now since the start of the Parks Series, which of course means that I've been to 6 different Michigan State Parks. So far it has been a great experience and I'm quite happy that I decided to do this project. It has had it's challenges but for the most part it has been quite rewarding. As last years 'Pier Series' was winding down I was thinking about doing another series and of the few 'series' that I could think of doing this one sounded the most interesting. January. Silver Lake State Park. Once I decided that it did in fact sound like a good and "doable" series I had to do a bit of research and come up with a list of parks that would hopefully be interesting to visit and photograph. The first on my list was one that I had been to on many occasions, Silver Lake State Park. This has always been one of favorite parks in West Michigan, with it's awesome dunes, beautiful Silver Lake(even frozen) and Little Sable Point Lighthouse it is pretty much a photographers dream. The most difficult part of creating images at this park is trying to decide which part to be in when the natural light is at it's best and that's not really a bad problem to have! I'm sure many of you, particularly west siders, have been to this park and if you haven't you need to go! February. Ludington State Park. After shooting at Silver Lake State Park I took my time in deciding where to go next. The weather was absolutely terrible in January and February and I knew I wanted to go somewhere closer to home. Which brought me to Ludington State Park. I drove through white out snow and at times a one lane expressway due to drifting snow but it was worth it! When I finally arrived, after about a 2 hour car trip that's normally 1 hour, the snow stopped and the clouds parted a bit. I hiked around for quite some time and ended up eventually at Big Sable Lighthouse - a two mile hike through snow which was actually quite relaxing. This park, which I had been to twice before, was quite beautiful covered in snow! March. Fisherman's Island State Park. Ahh March. Man, do I not like March. It's still cold. The remaining snow is brown and crusty. Winter's over but Spring hasn't arrived yet. I just don't like March. Which made it kind of unfair for Fisherman's Island in Charlevoix when I went to photograph it in March. This park, however, deserves a revisit. Underneath all the ugly snow and half melted ice I could tell there was a fantastic park. There was rocky beach, gently flowing creeks and beautiful old growth forest and though I may not have really enjoyed my time there I can't wait to get back now that the weather is improved. Unlike the first two parks in the series, I had never been to this park before and I encourage you to check it out, just not in March. Oh and by the way, there is no island and I saw no fishermen but I'd still like to go back. April. Hartwick Pines State Park. In April I ventured away from the Lake Michigan coast and travelled to Hartwick Pines State Park in Grayling. Yet another fantastic State Park. It has miles of hiking through gorgeous forest, the east branch of the Au Sable River and my favorite spot in the park, Bright and Glory Lakes. These two lakes were created by passing glaciers over 10,000 years ago and they are absolutely stunning to observe and photograph. To me, these two lakes are how all lakes should be - no houses - no boats - just a couple docks to fish from or, of course, set up a tripod. I'm sure this park is well visited by those on the east side of the state but I had never been and I'm glad I got the chance to visit! May. Tawas Point State Park. I had been looking forward to visiting this park ever since I decided to do this series. It was another park that I had never been to before. It was Memorial Day weekend and the park was quite busy with folks all around and I had a bit of difficulty(ok a lot) getting into that "comfort zone" where photographers like to be when we're creating images. Eventually, the sun started setting and the park visitors started leaving. When dusk settled in I was able to create one of my favorite images of the series date - the image in this post featuring Tawas Point Lighthouse. June. Wilderness State Park. The shoot at Wilderness State Park was a bit of a change as I was able to bring my wife and son along on the trip! In a wise decision, they stayed at the cabin while I was shooting and being absolutely devoured by mosquitos! The park itself is only a couple minutes from Mackinaw City(which is apparently a Village....) and it has some stunning shoreline and fantastic wilderness(go figure). This definitely is a park I would like to get to again and another I hadn't been to before. I'm actually still processing images from this park so stay tuned to the website and to Facebook for more pics from this park, I think there are a couple you may like! If you were keeping track you noticed that the majority of theses parks I had not been to before and that creates a bit of a challenge. I personally like to go places multiple times and a get a feel of where I want my camera set up and when I might need to be in certain locations. But on the positive side this makes me think a little more "on my feet" and might make me create images I wouldn't normally create. It gets me a little out of my "comfort zone" and that's not always a bad thing! Thanks for taking the time read the latest Fine Michigan Photography Blog post and stay tuned for more photos from the Parks Series and I promise the next post will be a 'Photographer Profile'! Feel free to stick around and check out more photos from the Parks Series in the slide show below or click the link to go to the Parks Series page on the website! Photographers have all kinds of equipment. And people are always curious what we have "in the bag". We often talk about what brand of camera we use(everyone, with the exception of Craig Sterken, knows Nikon is the best and Cannon is for chumps), how many megapixels is it, is it a full frame or crop sensor camera? Then we talk about lenses. Nikon vs Sigma vs Tamron vs Canon vs Rokinon vs Zeiss. Is it a 2.8 or 1.8 or 4-5.6 variable and bla bla bla and on and on and on. And then we discuss tripods and battery grips and tripod heads and lens filters and flashes and even the bags we keep all this stuff in! Don't get me wrong, I love talking about this stuff but that's not what this post is about. This post is about the "gear" I use - and would be lost without - after I'm done using all that other stuff. In an attempt to keep the post a readable length I'm only listing 4 things. Hope you enjoy it and let me know in the comment section what you guys like to use! 1. Adobe Lightroom. Without question the most important piece of software I use is Adobe Lightroom(or Lr for those "in the know"). Before Adobe released Lightroom way back in 2007, many photographers(myself included) were using the bulky, complex and sometimes confusing Adobe Photoshop. There was really nothing wrong with Photoshop(and there still isn't) it was just too much software for most photographers. So when Adobe did release Lightroom, which could do about 90% of what Photoshop could do and do it more efficiently, many photographers were excited with the potential. The potential has since formed into being the "standard" for image processing. Lightroom makes almost every aspect of image processing easier. Within Lightroom you can obviously "develop" your photos to make them look how you want them to plus you can also organize photos, print photos, share photos, create panoramic images, create HDR images, make a book and you can do this all non-destructively and efficiently(for a quick overview of non-destructive & destructive editing check out this link). It's really quite amazing what this software is capable of doing. There is even a Lightroom mobile app(for monthly subscribers) that allows you to process and edit images from your phone or tablet. This software is a HUGE part of my workflow! 2. Epson 4800. Ahhh, the joys of printing! I love printing. I print every image that ends up on the website. I print all standard matted prints that go to customers along with each and every notecard that I sell as well. While some folks have gotten into the habit of just sending files to "the lab", I print everything because I truly enjoy it. I could go on about printing(and I may in another post) but for now I'll just tell you that I currently use an Epson 4800. There are newer and more impressive printers available but this printer has been so good to me that I just can't get a new one! I have had issues from time to time with nozzle clogs and error messages but every time I think it's time to look for another printer the old girl comes back to life and keeps chugging out beautiful, color accurate prints. I'm sure you can probably find these printers "on the cheap" online and I would say if you see one for a couple hundred bucks go ahead and get it . I love this thing! 3. Google Drive. There are a number of cloud storage services out there and I'll be honest, I haven't tried most of them. I haven't tried others because Google Drive is so stinking easy to use. It works like any folder(or drive...) you would normally use with the exception that the files you put on Google Dive are stored in the "cloud". The draw of cloud based storage is that files within the "drive" are stored offsite - in the cloud. So if my hard drive(and backup hard drive) gets fried, I always have a backup offsite on Google Drive. Plus, files are accessible on any device. So, for instance, if I wanted to show someone what one of my metal prints looks like - like the case was a couple weeks ago at a party - I just go to the Google Drive App on my phone, do a basic search(because it has a search function as well), pull up the image and show whoever is interested. If I want to add an image to my website and I only have my laptop, I simply head to the Google Drive folder, find the image and add it to the website. Google Drive is a simple, affordable and for me a necessary piece of "gear". Prices range from Free for 15GB of storage all the way to $300/mo for 30TB of storage. I personally pay $2/mo for 100gb of storage. 4. Wacom Intuos Pro Tablet. Of course I'm going to save my favorite for last! The Wacom Intuos Pro Tablet has absolutely changed my photographic editing workflow. It has made the process easier, more efficient and just flat out more enjoyable. If you're not familiar with the Wacom line of tablets, they are essentially standalone trackpads - like on a laptop - on full Barry Bonds steroids! The Intuos Pro has touch and gesture capabalities - meaning that you can use it like a regular trackpad but also use multi-finger gestures(such as 3 finger swipe) to do a multitude of tasks, like switch between open applications or show the desktop or basically anything else you tell it to do! That's right, all the gestures are customizable to do what you tell it to. Oh and all the rectangular buttons you see on the left side of the image, those are customizable too. That "wheel" in the middle of the left side, that can be used to change brush sizes, scroll through images or just about anything else because wait for it... it's customizable too! A couple custom commands I created and use frequently are "undo", "show desktop" and "show in full screen". The Intuos Pro also comes with a pen and the pen is awesome. Wherever you drag the pen across the tablet a corresponding move is made with your cursor on the monitor and tapping it on the tablets surface is the equivalent of a mouse click. It takes a bit of time to get used to using a pen vs a mouse but it ends up feeling more natural. The pen also has two buttons on the side(one which you'll likely want to make a right mouse click command) and an "eraser" button on the end. And yes, the buttons on the pen are customizable too. Clearly there is a lot going on with these tablets as far as customizable functions and there is a bit of a learning curve but trust me, once you get this set up to your liking you will not regret using one! After a while you really start to wonder why you ever used that crazy prehistoric mouse! Wacom makes a wide variety of tablets and they range in price from $40 to $2,800. There ya have it! The 4 things I need to survive after the shutter is clicked. What do you guys like to use? I would love to hear from you in the comments below! As always, thanks for taking the time to read the Fine Michigan Photography blog! Stay tuned for the next post in a few weeks, it will be another Photographer Profile! Hey guys! It's time for another 'Photographer Profile' on the Fine Michigan Photography blog. This time around the very talented Craig Sterken was kind enough to answer some questions and share some beautiful photos from the Mitten State. If you aren't familiar with his work, I think you will be truly impressed with the beauty and vision in Craig's images! Enjoy! CS: I used to Scuba dive as a hobby as well as for a part time job and I wanted to capture some underwater photos. This was the mid to late seventies and I bought a Kodak 110 camera and an underwater housing. Unfortunately, my underwater Michigan photos didn’t compare to the photos I was seeing in Skin Diver magazine! But I had a great time messing around with it. After that, I bought a 35mm Minolta and I used that until 2000 when I bought a Canon Rebel DSLR. CS: My wife and I have been visiting Ludington for over 30 years and have taken at least one family vacation a year there, every summer. We’ve done the Disney thing with the kids a couple times, but they still insist on a Ludington vacation as well. 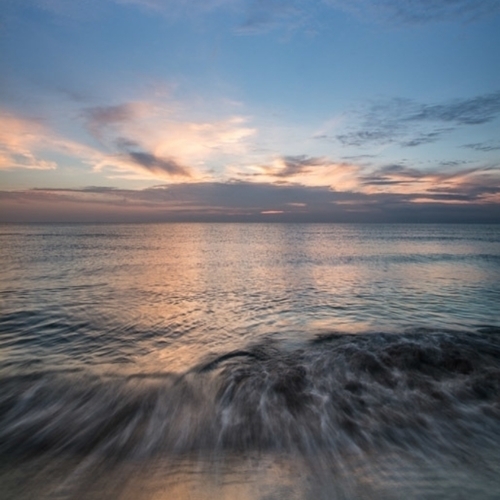 We all consider it a second home and for that reason, Ludington is a favorite. But really, anywhere along Lake Michigan is a joy to shoot. Sleeping Bear Dunes, Leelanau, and the Upper Peninsula are among my other favorites. With those locations there is just so much variety. I’ve been spending a lot of time in the UP the last two years and the more I visit, the more I want to return. Michigan is hard to beat when it comes to photography. CS: Autumn is hands down my favorite time to be in the field. The colors are vibrant, sunsets really put on a show, morning and evening light are at their best, and it’s just a great time to be outdoors. My wife and I love the outdoors and although summer is my favorite season to be out, autumn just has so much more to offer a photographer. CS: The variety of subjects available. A great example is the Porcupine Wilderness Area. In one day, you can shoot the sun rising over Lake of the Clouds, drive over to Presque Isle River and shoot the various waterfalls that run along the western edge of the mountain and then get down to Lake Superior for a sunset shot. It’s amazing what you can do in one day in Michigan! The same is true along Lake Michigan. You can shoot numerous lighthouses with a one day trip. 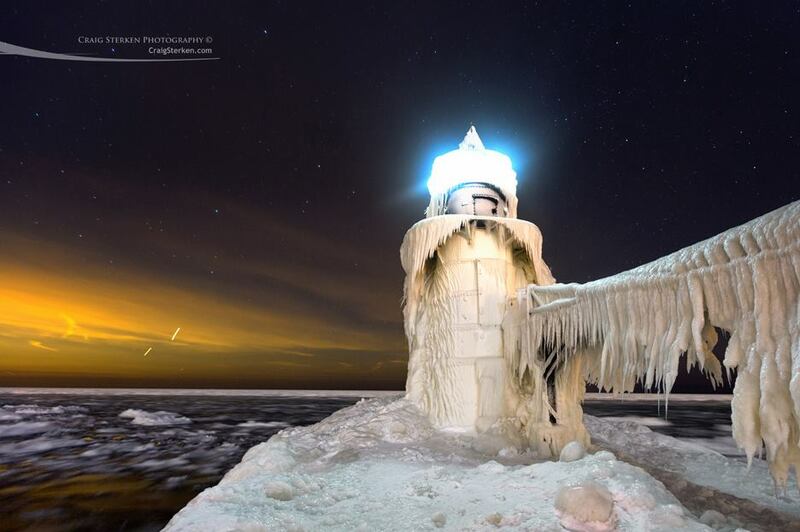 This past winter, I shot frozen lighthouses at Grand Haven, South Haven and St. Joseph, all in one day! CS: That’s an easy one. I can tell you flat out that I would not be doing this if it were not for the influence of Todd Reed. For years when our family would visit Ludington, I would admire Todd’s work and think it was something I’d like to try. Todd just has a very artful eye with a lot of thought put into his work. It was amazing to me how his images could inspire the same feelings I had when I was actually watching a sunset, or another landscape scene. I wanted to be able to express myself that way as well. As interest in my work grew, I knew I wasn’t at the level I wanted to be. So I took a class with Todd and Brad and things really improved from there. I used to spend a lot of time on Flickr and other photo sharing sites. Over time, I think you just get a feel for what you want your style to be from shooting a lot and looking at other work. Beyond the Reeds, there are quite a few people out there whose work I admire - Neil Weaver, John McCormick, & Richard Thompson, immediately come to mind. CS: Other than the one day class that I took with Todd and Brad Reed, I’ve never had any formal training. I’m constantly learning though. I’m always seeing new techniques and reading blogs, etc. Every time I go on a long shoot, of several days, I pick up something new. Just the act of all that shooting and then evaluating your work when you return helps you learn new things. It may just be something small with composition or learning a limitation with your gear. I don’t think any photographer ever stops learning new things. I tend to shoot alone a lot but I’ve picked up something new every time I shoot with another photographer. You can’t help but talk shop when you’re out shooting with someone else and it’s a very helpful way to learn. CS: I did a remarkably stupid thing several years ago. I was out at Ludington State Park in the winter and shelf ice extended way out onto the lake. I have been one to preach about the dangers of shelf ice and am cautious by nature. I saw about a dozen people out there on the shelf ice. I got caught up in the moment and figured it was okay since all the other people were out there. I ended up on the edge and was about 25 feet above the surface of Lake Michigan. I got a couple really great shots but after the adrenalin died down, I realized I had to make my way back off the ice. I was nervous the entire way back, realizing just how stupid it was. The photo was popular and was broadcast on a news station but it was not worth the risk. No photo is worth that kind of risk and I’ve promised myself not to get into that kind of situation again, at least not with intent. Although the photo has been popular, I tend not look at it often as it annoys me that I did something so incredibly stupid. Do you like the effect social media has had on photography and do you feel the effect has been better or worse for photography? CS: I think it has had a huge effect on photography. I think it’s a mixed bag for whether it’s is better or worse. With social media we have instant feedback on what is going on in the field. I traveled with another photographer to the UP for the Grand Island ice curtains this past winter. Without social media, it would have been difficult to know when the conditions were right for the trip. Also, many of the photographers whose work I follow, I would not be aware of were it not for social media. Because of Facebook, specifically, I have met and gone shooting with several other photographers or recognized them in the field. Some, I have become good friends with and look forward to future photo treks with them. So, it has connected me with some great people. Also, a lot of my sales are driven in one fashion, or another, from social media. I would estimate half of my business comes from there. One of the downsides is that I see people shooting for what they think will be popular, rather than what they like themselves. If you look at what’s popular on 500px or Flickr, you begin to see oversaturated, fake looking photos and they all look the same. Even magazines like Outdoor Photographer are pushing a certain type of look. I’m not knocking anyone if that’s what they want to do, I just don’t think it’s helpful to chase a style or to create work in anticipation of what others may think. The other downside to social media is that it has become a necessity and it requires a fair amount of time to manage it well. I’ve begun to scale back the amount of time that I interact on social media. It’s easy to get hung up on spending every spare moment looking at others work and commenting. I’d rather be in the field shooting or processing images I’ve already shot. There’s only so much time in a day and I don’t want 20% of it to be taken up with Facebook. I’m sure that it has an effect on my sales when I bow out for a few days, but that’s okay. What do you currently have in the gear bag? -Canon “L” series lenses – 70-200mm f/2.8, 24-105mm f/4, 16-35mm f/2.8, 400mm f5.6, Canon macro 100mm f/2.8, and a cheap Canon 50mm f f/1.8(nifty-fifty). -Various filters i.e. CPL, ND, Vari-ND. The ND’s are Singh-Ray and the others are B+W. -My wife, to help me carry everything! Well, I hope you enjoyed the latest 'Photographer Profile'! I would like to thank to Craig for sharing his amazing work with the Fine Michigan Photography blog and if you're not already following Craig on the social media sites why not go ahead and follow him on Facebook, 500px, Flickr and Instagram?! We love interacting with people on social media but we also like selling our work! So I would like to encourage you to check out www.CraigSterken.com and order a beautiful print to hang on your wall. Thanks guys and feel free to leave comments below and add your email to the subscription list to receive future newsletters and blog updates! Slow down and take your time. That's the best advice I was given years ago when I first picked up a camera and it's a lot easier said than done. For me it took practice and can still be a challenge. I was like many photographers starting out - eager, excited and lacking patience. It's so easy to want to move fast and get to the next image. It's especially easy these days with gigabytes upon gigabytes of empty storage space just waiting in our cameras to be filled. But we gain almost nothing by quickly moving from one composition to the next. If you find a composition that you like, slow down and take your time. Make sure it's framed just right. Make sure all the camera's settings are where you want them. Give yourself time to see what happens when the light changes or if you slow the shutter speed down by a 1/4 of a second. You might be surprised how your photography improves by simply slowing down and taking your time. Remember, photography is about quality not quantity. The photos below were taken less than 10 minutes apart. They're obviously slightly different compositions but I generally knew how I wanted the final image to look. I had a feeling that being patient would pay off in that situation as the conditions were good for the sky to "explode" with color. Now, there's nothing wrong with the first image, the clouds are actually quite interesting and make for a fairly dynamic photo. But the second image is much stronger, with the clouds changing dramatically in color after the sun went below the horizon. I achieved this by doing nothing but waiting(sure I moved a few feet to the left but that didn't have an effect on the lighting). I could have easily been bouncing around the pier, going composition to composition but I think I would have ended up with many mediocre images as opposed to one good image. I think this pair of photographs demonstrates perfectly what can happen when we just slow down and focus on making one solid composition. I also think that if we want to make better photographs we have to slow down and take our time after the shutter is pressed. The editing process is an important part of photography and rushing through it is just as bad as rushing the process of creating the image and potentially worse. One habit I've formed in recent years is 2 fold: 1) I don't process any images on the day they were made - I'll download them to the hard drive and come back usually the next day to see which images I want to keep. 2) Once I've gone through the images and process any I want to keep to a "publishable" point, I will then leave those for another day or two and come back periodically to view them. 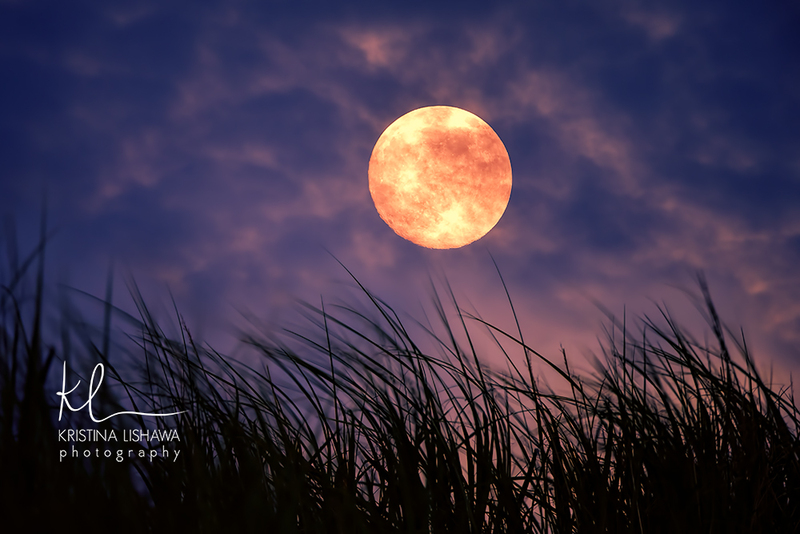 I've found that when I don't do this and I try to rush an image out, usually in attempt to get "quick credit"(which almost always ends with a bad image and regret) I end up with a photo like the one here of the "blood moon" from last October. It's just not a good image and wouldn't pass the basic test of "Would I hang this on my wall?" Had I slowed down and let this image stay on my computer for a few days I would have decided, likely, not to share it at all. But I did share it(regrettably) shortly after creating it and it even received some "quick credit" as it was shared by a local tourism site. But they shared an image I don't even like and why would I want that? For me photography is largely about sharing photos that I like and photos that would pass that test of whether or not I would hang it in my own home. Of course I would love for everyone to like my photos but if I don't like one of my photos the viewer likely won't either. By slowing down the "process" and taking my time it gives me more opportunity to rethink the compositions that I've created and ultimately share the best possible photo or maybe not share a photo at all. My process may seem a little slow and I'm certainly not saying that this is a perfect formula or will even work for you, but for me it's the best way to create quality photographs - Slow down and take your time. Thanks for taking the time to read this post! Stay tuned as there will be another post in a few weeks - a new 'Photographer Profile' post in fact! If you're not on the email list to receive blog post updates and other information and want to be just fill out the form below. When I first started the "Fine Michigan Photography Blog" one of my goals was to share other photographers work as well as my own. I thought a good way to do that would be to occasionally "profile" a Michigan photographer by asking them a few questions and sharing their responses along with some of their photographs. For the first 'Photographer Profile' I asked the very talented Neil Weaver if he would be interested and being the nice guy that he is, he kindly obliged. Neil has been photographing Michigan for 15 years now and has been an inspiration to many photographers, myself included. I hope you enjoy this first 'Photographer Profile' and the magnificent images by Neil Weaver, I'm certain you will. Thanks! NW: I’ve always loved art and even dabbled in photography in high school, but I discovered landscape and nature photography when I was twenty one years old. My parents had just moved to Pentwater from Sault Ste. Marie and at the end of that school year at LSSU(Lake Superior State University) I decided to spend the summer down there working. One night I borrowed my Mom’s 35mm film camera and headed to the pier for the sunset. I took some photographs of the lights on both piers, and when I developed them I liked what I saw. It wasn’t long after that when I purchased a Canon Rebel SLR camera and began shooting the area’s lighthouses and beautiful beaches. Do you have a favorite Michigan location to create photographs? NW: It’s difficult choosing just one but I’d have to go with the Munising/Pictured Rocks National Lakeshore area. So much to photograph there - the many photogenic waterfalls and stunning cliffs that tower over the lakeshore. The beautiful beaches - Miner’s, Mosquito, Chapel, and Sand Point. 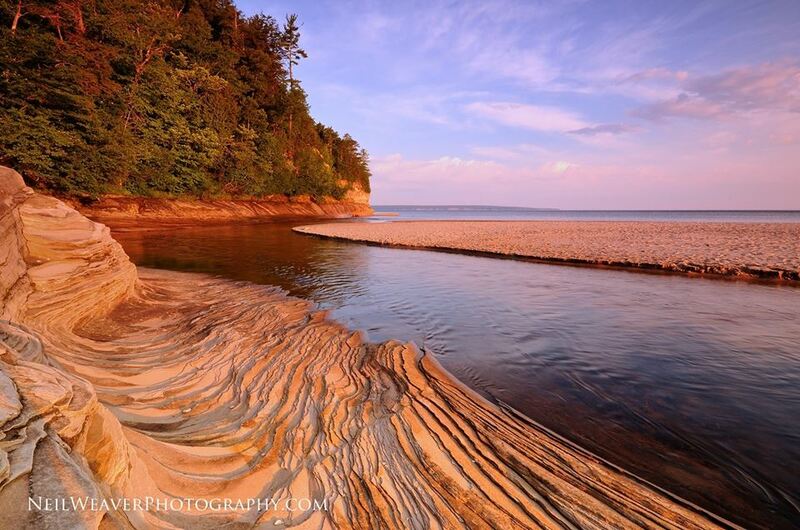 A stay in Munising gives a photographer a lot of options. NW: My love for Michigan and the Great Lakes goes back to my childhood. My parents loved the outdoors and would take my sisters and I on day trips to places like Point Iroquois Lighthouse, Cut River Bridge and the Huron shore near Cedarville. When I’m photographing all of these beautiful places in Michigan I feel like I'm not just there visiting but I’m truly experiencing them, and now I can share my impressions of each location with an audience. NW: I love to shoot in the fall. To me there’s nothing more beautiful than the explosion of reds, oranges and yellows at places like Tahquamenon Falls, Lake of the Clouds, or Brockway Mountain. The season has a pretty short window before the leaves drop which makes it even more special to me. What photographers have influenced you or inspired you the most? NW:There are a few but Todd and Brad Reed were my biggest influences from the beginning. During those couple of summers I spent in Pentwater, I would head up to Ludington and look around in their gallery. Viewing their work has always been inspiring. It really got me excited to photograph the natural world around me and view it photographically. Todd and Brad were always very kind and answered any questions I had, and I am really grateful for that. With such great compositions and clearly an excellent knowledge of all that goes into creating a strong image, you must have attended school to advance your photographic talents, right? NW: I never studied photography in school, in fact I’ve never even taken a class or attended a workshop. I learned through reading books on composition, exposure and light. But overall, it comes mostly through practice, learning from my many mistakes along the way. Are there any photography books in particular that you currently like to reference(photographers always have at least one book dogeared!)? NW:The last few books I’ve read are 'Visual Flow' by Ian Plant, 'Mountain Light' by Galen Rowell and 'Nightscape' by David Kingham. How do you feel about the relatively new influence social media has had on photography and what do you feel may be a positive and negative aspect of social media? NW:I like it for the most part. I don’t know if social media has made me a better photographer or not but I’m viewing much more photography each day which can be inspiring. I have met a lot of other photographers through social media, some really cool people that I enjoy talking shop with. Some of them I have met in person and since then have become good friends with. Another reason I like it is because it has been instrumental in growing my business. A pretty significant amount of my sales have come through Facebook and I always enjoy the enthusiasm of my page followers. On the negative side, early on there would be occasions where I would find myself photographing subjects and I’d catch myself thinking “I hope this gets a good response on Facebook.” It didn’t take long to realize that I wasn’t enjoying photography the way I used to. I learned that I needed to do this for myself, concentrate on shooting only what inspires me, and everything will fall into place. And finally, what everyone really wants to know - what's in your bag? I would like to thank Neil for being kind enough to be the first photographer in the 'Photographer Profile' blog series. I would also like thank everyone for reading this post! If you're not already following Neil on the popular social media sites be sure to click the following links to check him out on Facebook, Google +, Instagram and Twitter. After seeing just a sampling of his great work, feel free to head to www.NeilWeaverPhotography.com and order some of his fine photos! Thanks again!